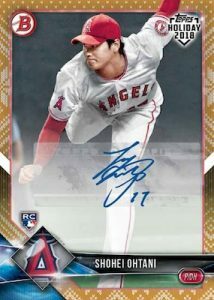 2018 Topps Holiday - Baseball Card Checklist	Overall rating:	3	out of 5 based on 1	reviews. 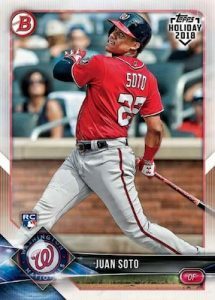 2018 Topps Holiday is a promotional product that offers special packs of Bowman Baseball to customers who buy $10 or more of Topps products at select shops. These packs contain 3 cards each and offer the chance at an autograph hit. 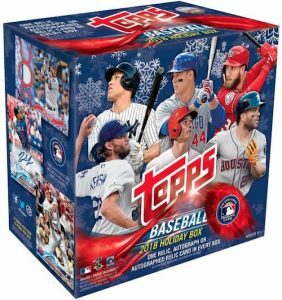 There is also a 2018 Topps Holiday Retail boxed product that is available elusively at Walmart (see list below). 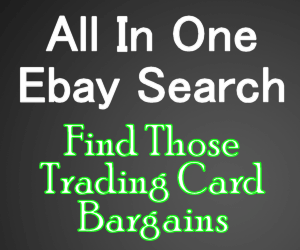 Topps has provided a map to shops offering the promo product packs, found here.